The Parish Council is the custodian of the War Memorial, erected following the First World War and standing in Horsefair Street in front of St Mary's Church. The Council carried out a refurbishment of the memorial in 2010 and the names of the fallen from World War Two were added in 2014. 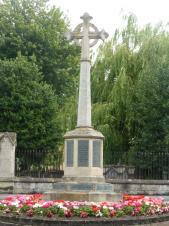 The Parish Council received an Award from Cheltenham Civic Society for the sympathetic upgrade of the monument. The family of Private William Joseph Hopkins, who was a member of the British Expeditionary Force in France and was killed just a month after the start of WW1, joined in a short ceremony to remember his sacrifice on Remembrance Sunday in November 2015. Councillors have steadily researched records to try to ﬁnd any Charlton Kings service men and women who have given their lives on active duty in the numerous conﬂicts since 1945. Do you know of any person who was resident or born in Charlton Kings who could be eligible? Since 1945 there have been conﬂicts in Aden, Korea, Cyprus and the more recent events but names from our parish have been difﬁcult to ﬁnd. Spaces have been allocated on the memorial for each decade, so please contact us if you know of any family member or friend who should be included. Charlton Kings in Bloom volunteers maintain the planting around the memorial.